The Mail app in Windows 10 allows you to attach files to your emails. You can also insert image inline (in the body of the email message) using the Mail app. While trying to attach a file, at times, you might get “We could not add all your attachments. Please try again” error. The error appears when the Mail app could not attach one or more selected file(s) to your email. If you are also getting “We could not add all your attachments. Please try again” error message, you can try out the following solutions to attach files using the Mail app. When you try to select a file via the Quick Access (it shows recently accessed files), the Mail app, at times, shows the above error. We are not sure why the error appears while selecting from the Quick Access, but you can avoid the error by navigating to the original location of the file instead of selecting it via Quick Access. While the Mail app supports large files (as long as your webmail service supports the file size), you might get the above error while attaching files that are in GBs. Either compress the file or split the file using file compression tools such as WinRAR and 7-Zip (free) and then try attaching files again. 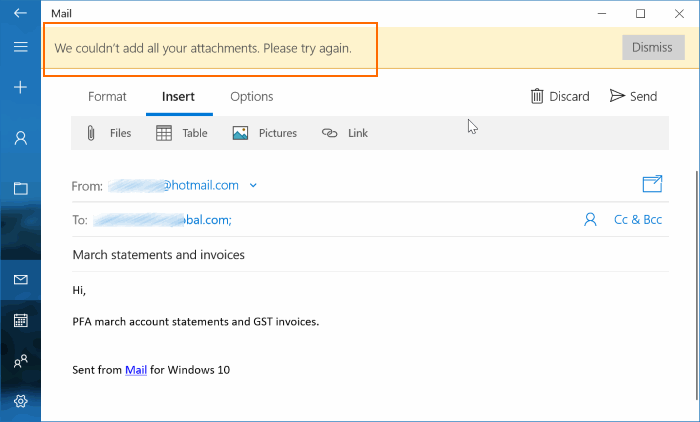 If you are getting the error and unable to attach files, you can try out resetting the Mail app by following the directions in our how to reset the Mail app in Windows 10 guide. Reinstalling the Mail app is the last resort but should fix the issue. Reinstalling the Mail app might remove all data from the Mail app, including sign-in information. You might need to enter those details again. Refer to our how to reinstall the Mail app for step-by-step directions.